*About 3 out of 4 candidates who pass the QLTS, study with QLTS School (data verified by ICF International (NASDAQ:ICFI), an independent, third-party research firm). The research covered three consecutive sittings of the MCT in 2013 and 2014. 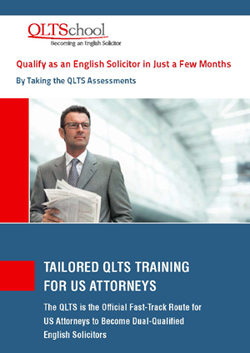 Enter your details to get our free QLTS brochure for US attorneys, with full information about the structure of the QLTS assessments, your eligibility to become an English solicitor and QLTS School’s preparation courses for the MCT and OSCE exams.